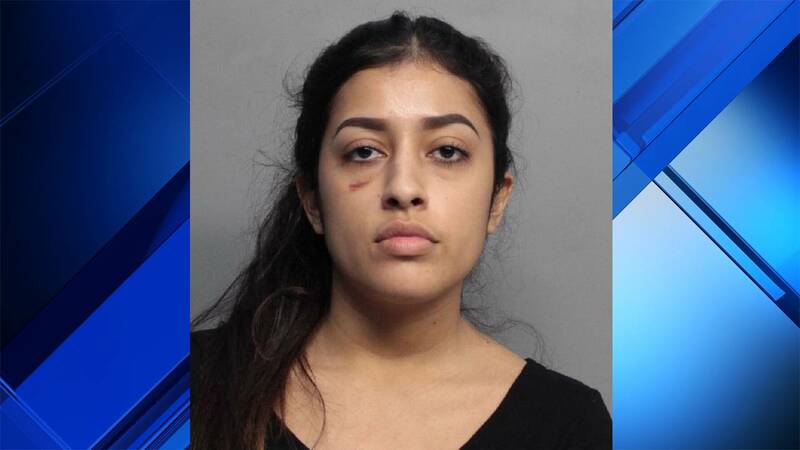 MIAMI BEACH, Fla. - A 24-year-old woman was released from jail Thursday hours after she surrendered to authorities in connection with an attack on a fellow Lyft passenger in Miami Beach. Sherry Moody declined to speak with reporters as she left the Turner Guilford Knight Correctional Center. According to an arrest report, Moody was in a shared Lyft vehicle about 4:30 a.m. Jan. 26 when she kicked, slapped and scratched a fellow passenger in the face, although she was unprovoked. Police said Moody was intoxicated and became angry when the Lyft driver refused to take her through a drive-thru for food. Authorities said Moody also got upset when the driver picked up the victim, Jose Gonzalez, 57, and proceeded to attack Gonzalez as she yelled, "You f***ing gays!" Gonzalez was kicked in the head with Moody's high heel, causing a puncture wound, the arrest report stated. According to the report, the driver immediately pulled over and removed Moody and her female friend from his vehicle. He then took Gonzalez home, where he sought police and medical assistance. Police said Moody did not provide a statement to detectives. She was arrested on a felony battery charge and was taken to the Turner Guilford Knight Correctional Center. Miami Beach police spokesman Ernesto Rodriguez said the case has been referred to the Miami-Dade State Attorney's Office, which will determine whether to charge Moody with a hate crime. "Presently, State Attorney Katherine Fernandez Rundle has been supporting a broadening of Florida's existing Hate Crime law to allow more victims a legal opportunity to confront hateful actions," Miami-Dade State Attorney's Office spokesman Ed Griffith said in an email. Gonzalez has since filed a lawsuit against Lyft, claiming that the ride-sharing service failed to protect him. Lyft released a statement after the incident, saying the woman's account had been deactivated and the company was cooperating with authorities. Reynaldo Martinez, Gonzalez's lawyer, said Lyft should screen its passengers much like it screens it drivers. "If Lyft chose to use technology already employed by the company to screen Lyft drivers, Lyft could potentially discover, warn and protect passengers from other dangerous passengers," Martinez said.